This is a Two-Part Post. You needed to complete the steps in the Part 1 before completing the steps outlined in this post. The above code refers to the following functions that you will need. 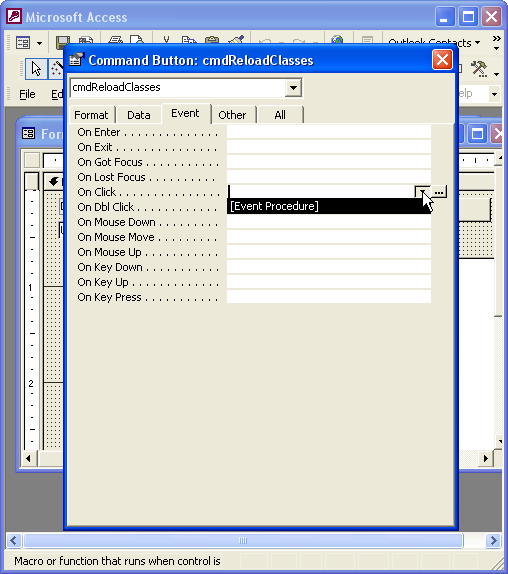 Now that the code is installed, you need to set the two command buttons' On Click events. 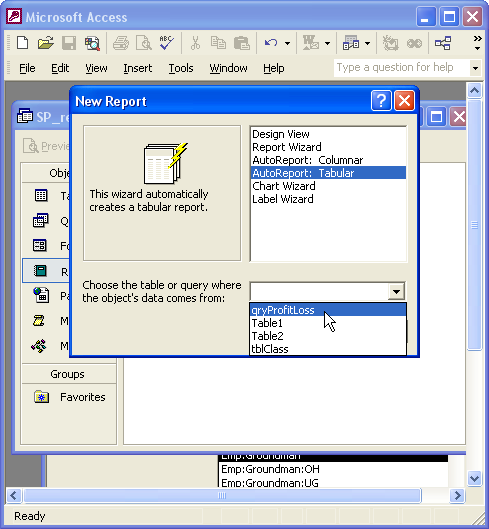 Move to the report that is in Design View and save it, thereby saving your code. Keep the report in Design View. Select the Event tab from the Properites Window. Scroll down to the On Click event. Repeat these steps for the Query button. 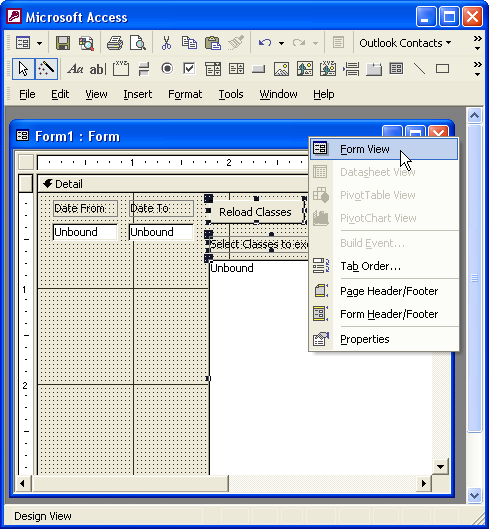 Change to Form View by right-clicking on the form and selecting Form View. 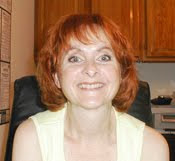 Click the Reload Classes button to fill the listbox with QuickBooks® classes. This list will not be restricted to active classes but will also include inactive classes. 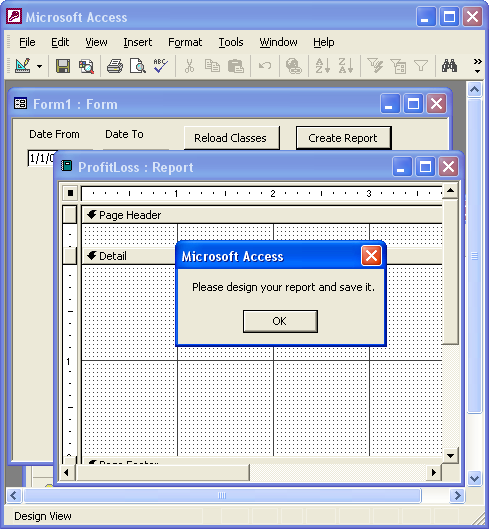 The assumption is that you may wish to create reports for past periods in which classes are no longer active. 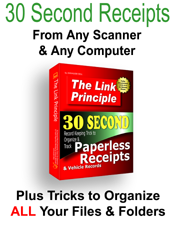 Wait for QODBC to connect to QuickBooks®, retrieve the classes, and fill the listbox. 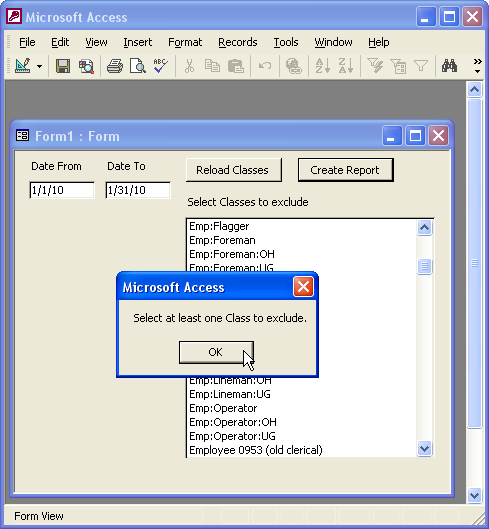 With dates entered and classes selected, click the Create Report button. A new report is created and named: "Profit Loss" and you are asked to design the report. 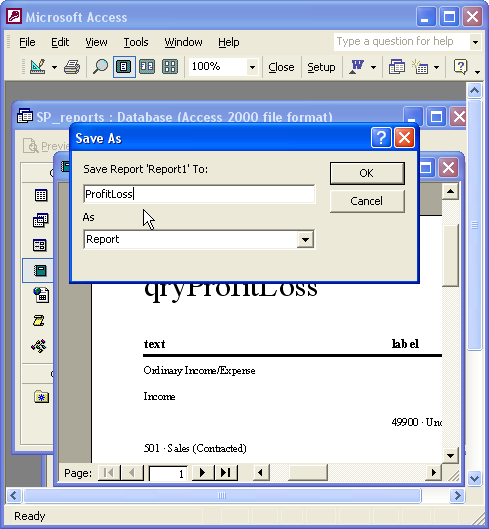 Close the new Profit Loss report and delete it from the Database Window. 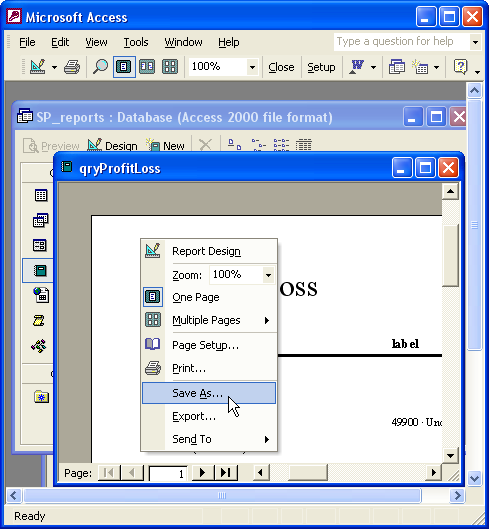 When the report opens, right-click anywhere on the report and select Save As. Make sure to name the report ProfitLoss because that is the report name the code uses to open the report. Fix up the report any way you like, just be sure to save it as ProfitLoss. Close the report and use the form to re-create it to confirm you saved it with the correct name and all is well. 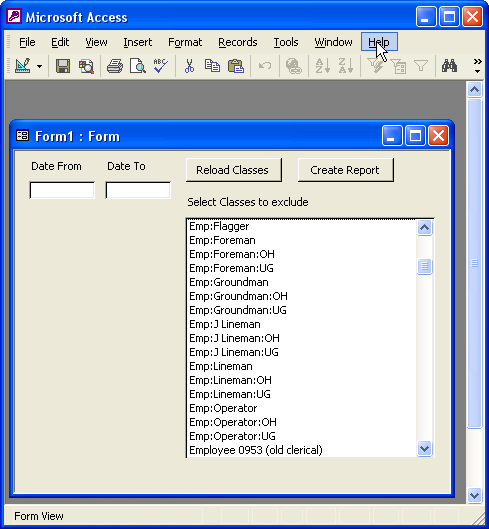 Create a 2nd Profit & Loss Standard report and modify it by selecting Multiple Classes from the Class Filter. 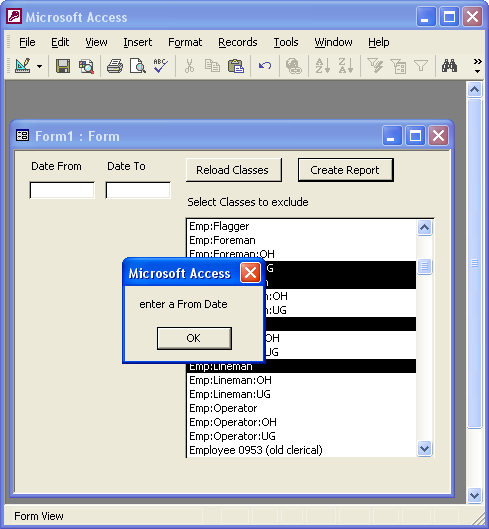 Be sure to select the same classes that you selected for your database report. Subtract the Net Profit from the 2nd (modified) report from the Net Profit of the 1st (NOT modified) report. 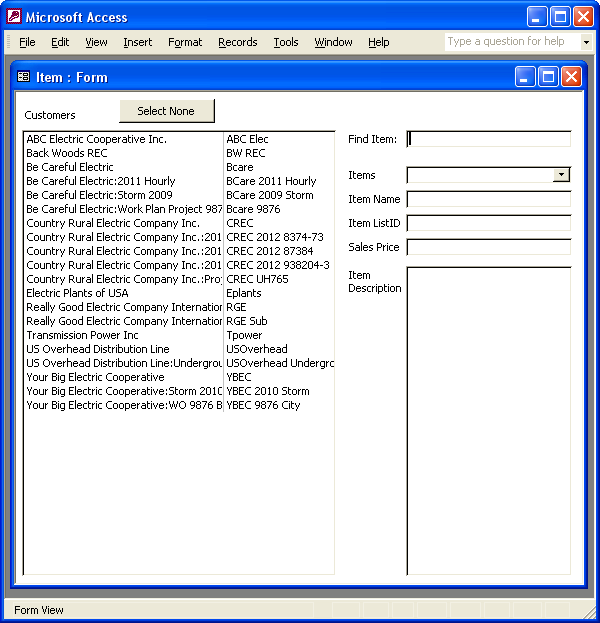 This amount should match the Net Profit from the AllClasses-SomeClasses column of your database report. Two minus negative one equals three.